Forklift Licence in Townsville: Application of Forklift Ticket is Easy! - Be Certified Today! Forklift Licence in Townsville: Application of Forklift Ticket is Easy! The number of forklift drivers in Townsville applying for forklift licences has increased in the last 5 years, This shows the Townsville is a good place to make a living a fork truck driver and to eliminate deficiency of skilled operators. If you are a driver who does not have a forklift licence and wishing to get one, here, we’ve provided that tasks you need to do. If you want to renew your licence online, we’ve also provided you how to renew it using your computer. 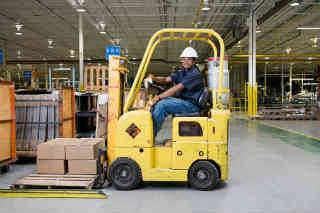 Take forklift training course at an RTO you chose. List of RTOs in Townsville is listed below for your reference. Attend the classroom training and informal/practical driving. These two courses usually take 3-5 days to complete depending on the extent and depth of the training you need. Inform the RTO of when you want to take the theory and practical assessment. You must book for reservation of assessment six (6) days advance. WHSQ required all RTOs and assessors to give 6 days notification prior to conducting an HRW licence assessment. Applicants will receive assessment summary form and statement of attainment after successful assessment. Before you can go and lodge your application to Australia Post, you need to fully complete these requirements. Incomplete requirements will not be accepted and cause delay for days. Original F1 application form – complete this form and you must ensure that all information needed are filled up and supplied. Assessment summary given to you by the assessor when you completed the forklift training. Old HRW licence (if you have any) – if you are a holder of old format licence, you must submit this to transfer the details to the new licence. Proof of identity – you must complete the 100 points evidence of identity before your application gets accepted. Digital photo – your digital photo can be taken at the Australia Post, so you need to appear personally to submit your requirements. Application fee – pay the amount of $70. The payment can be made in credit card, EFTPOS, cash, cheque. Submit these documentary requirements to the nearest Australia Post within sixty (60) days after completing the assessment. You will receive your photographic and new format licence within 2 weeks after lodging the requirements to Australia Post. You can perform high risk work by just presenting your Assessment Summary and Notice of Attainment given by the RTO and the receipt issued by Australia Post. These proofs that you have tendered your forklift licence application, awaiting its release. If you are in possession of an HRW forklift licence which is nearing expiration, you will receive renewal notice four (4) weeks before the date of its expiration. The notice will detail if you are eligible to renew it online. You need the following: driver licence and card numbers as indicated in the card; the control number located in the renewal notice you received; applicant’s given name and family name indicated in the licence card; your DOB; payment in form of credit card, you need to submit the credit card details and fee may differ depending on the renewal length. Upon successful application, you will receive your new licence ten (10) working days after. You can also need to submit documents as proof of identity. If you are not longer a resident of Queensland or have been contracted to work in other territories. If you are suspended to hold an HRW licence for whatever reason. If you have cancelled licence and disqualified to hold one. If your current licence does not have an “S” condition. If you are a holder of an old format licence (laminated), then you need to renew it in person. If your licence is just a learner’s licence. If you did not renew your licence within 28 days after its expiration. If you do not have your digital photo and signature taken. The photo must be taken in the last nine years. If you do not have a submitted medical certificate lodged to Workplace Health and Safety Qld.